Professor Das received his BS (1972) and MS (1974) in Physics from the University of Delhi, India and his PhD in Physics from the State University of New York at Stony Brook in 1977. He was a Research Associate at the City College of New York, the University of Maryland, and Rutgers University before joining the University of Rochester in 1982 as Assistant Professor of Physics. He was promoted to Associate Professor in 1986 and to Professor in 1993. He is the recipient of University and Department awards for his teaching, including the Department Award for Excellence in Undergraduate Teaching, Department of Physics and Astronomy, University of Rochester four times (1987, 1990, 1997, and 2006), the Edward Peck Curtis Award for Excellence in Undergraduate Teaching (1991), and the 2006 University Award for Excellence in Graduate Teaching. He was named a Department of Energy Outstanding Junior Investigator (1983-1989) and received a Rockefeller Foundation Award in 2004. He received Fulbright Fellowships twice, one in 1997 and one in 2006. Professor Das was elected a Fellow of the American Physical Society in 2002. Professor Das' research is in the area of theoretical high-energy physics. His research has focused on questions of symmetry in the fundamental laws of nature. In recent years, he has worked extensively on nonlinear integrable systems -- systems which in spite of their complicated appearance can be exactly solved. He has also been working on finite temperature field theories, generalization of the Standard Model to incorporate CP violation, and problems in quantum field theory and string theory. 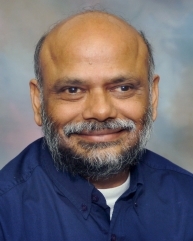 For further details, go to Professor Das' home page at:http://www.pas.rochester.edu/~das/homepage.html.